The money you pay for Singer S18 will be worth it, if you can make use of all its features. It is loaded with advanced features. It has a limitation as well. Singer S18 is a feature packed sewing machine for sure, but it is not entirely Singer. Yes, this machine is made by Janome for Singer. To be precise, it is built on the Janome MC 6500P platform but with a Singer casing. This is pretty much evident from the Janome accessories that comes with S18. One good thing that Singer has done is that they have made it look more beautiful and better priced than the Janome 6500P. Singer S18 is features galore, literally. It comes with a total of 408 built-in stitches which include 10 Direct Selection Stitches, 80 Quilting Stitches, 60 Utility Stitches and 258 Alphanumeric Stitches. It also includes 7 one-step buttonholes as well. For monogramming, S18 comes with 2 styles of alphabets and numerals (block or script style in both upper and lower case). You can monogram them at 5mm or 7mm stitch width. The LCD screen of S18 is a super computer on itself. It displays a lot of information, so much so, that you sometimes feel bombarded with quite a lot of info at the same time. It will display the stitch settings, recommended presser foot, needle settings, recommended tension etc. The maximum stitch width that can be set is 7mm. One thing I really liked is the fact that the screen shows the image of the selected stitch instead of a plain number. The screen also has an option to select from 10 languages (which is really cool). The screen brightness is adjustable. Singer S18 comes with built-in memory as well. Now you can create stitch pattern combinations and save it in the memory for later use. You can save up to 50 patterns in this way and can easily retrieve them with the push of a button. The pattern will remain in the memory even if you turn off the machine (which makes sense). The best thing I like about Singer S18 is its large throat. It has a mouthwatering 9” x 6” of bed space, which is just the right room required for large quilting projects. I would consider the sewing space as the highlight of this machine, even though it comes with a lot of other bells and whistles. Large sewing space makes a huge difference for me. It is like entering an SUV from a hatchback that you used to have. Lots of room, lots of features and can handle hard stuffs. Singer S18 comes with a knee lifter, which is a premium feature. Knee lifter makes it so quilter friendly as you can raise or lower the presser foot without taking your hands off the project. It works as an extra hand. The machine comes with a top drop-in bobbin and an independent bobbin winding motor, so that you can continue sewing even while filling the bobbin. The bobbin cover is transparent, so that you can have an eye on the thread supply. The foot pedal gives you a sense of control. It gives you good feedback and sewing at lower speeds is a breeze. This will come handy while you are dealing with multiple layers of fabric like denim. There is a stitch elongation button for elongating select stitches up to 2-5 times longer. Select stitches can be mirror imaged as well. A separate button is provided for mirror imaging. 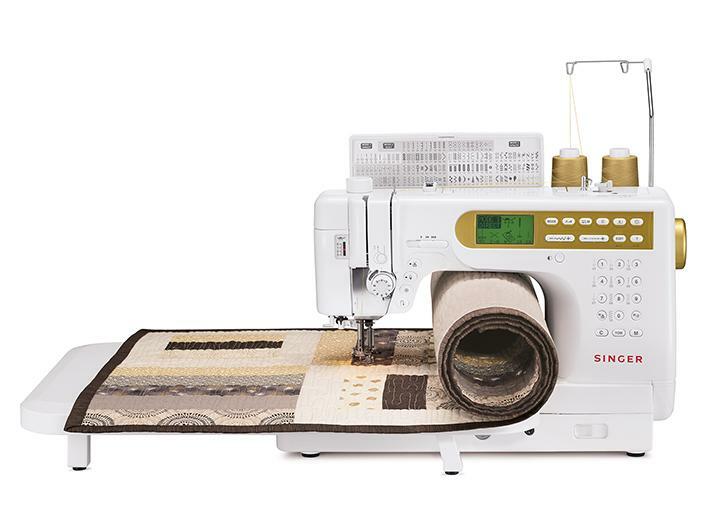 Singer S18 comes with 15 needle positions. The automatic twin needle mode automatically adjusts select stitches for twin needle sewing. The drop feed option with box feed allows perfect feeding. If anything goes wrong with the settings, the machine will beep an error alarm, which can be switched off if you don’t want it. In addition to these features, S18 has all other standard features that you normally find on advanced sewing machines. Programmable needle up/down, automatic needle threader, automatic thread cutter, presser foot sensor, variable speed control, extra-high presser foot lifter etc are some of them. Sewing light is also provided. It has a heavy-duty metal frame inside. The motor is pretty powerful and is capable of delivering 1000 stitches/min. The machine comes with 25 year limited warranty. Being an advanced sewing machine, you expect Singer S18 to be heavy and it is. It weighs 26 pounds. It comes with an extension table as well. Being a Janome sibling, you will never feel like wanting more in terms of quality. The overall build quality is excellent. S18 comes with a very well written user manual. The instructions are clean and easy to understand. This has to be one of the easiest Singer machine to thread. The ability of Singer S18 to handle multiple layers of denim is very impressive. It doesn’t struggle at all, thanks to the powerful motor. All the decorative stitches come out nice and clean. The biggest challenge I faced during reviewing this machine is that, I had to spend a lot of time to test all of its features. It has so many features, that an average sewer might not even use. The best thing about Singer S18 is that it is capable of sewing anything that you throw at it. This is a machine that is built to last. The biggest bummer of S18 is the lack of free arm sewing. Honestly, at this price you expect free arm as a default. The foot pedal has a cheap look to it. It is lightweight and it moves around on the floor. Singer could have made it of better quality material. It is a better quilting machine than I initially thought. S18 is a feature packed sewing machine and at first you might feel intimidated by its features, but slowly you will fall in love with it. The price is affordable as well, especially when you consider the price of Janome 6500P which costs few hundred dollars more. All in all, I am very much impressed with Singer Studio S18. Professionals will love it.